OMAHA, Neb. — Game 2 of the 2018 College World Series will take place on Wednesday between No. 3 Oregon State and No. 5 Arkansas at TD Ameritrade Park here in Omaha. No. 5 Arkansas moved within a win away from capturing its College World Series national title after earning a 4-1 victory over No. 3 Oregon State in Game 1 on Tuesday night. A win for Arkansas on Wednesday will see them becoming the sixth team from the Southeastern Conference (SEC) to win the College World Series championship in the past 11 championships. The Beavers took a one-run lead in the bottom of the second when Trevor Larnach scored on a Michael Gretler single. 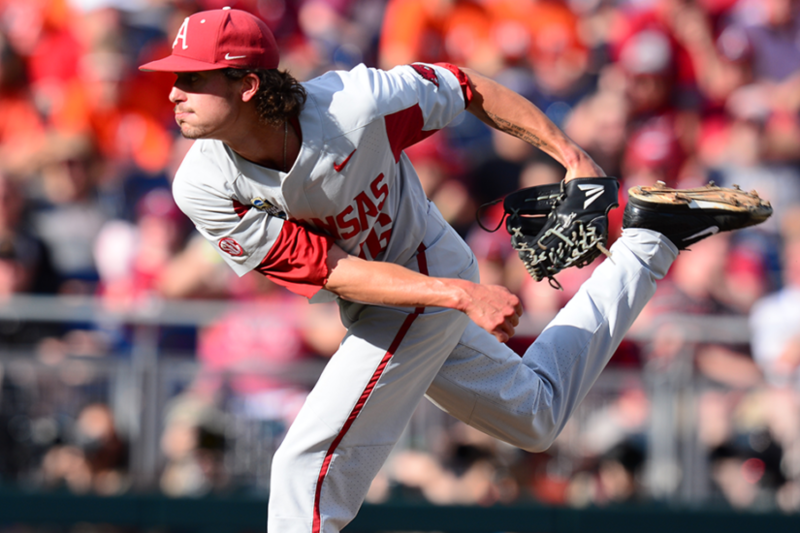 They held that advantage until the 5th when the Razorbacks exploded for all four runs, which, included two singles and a walk, while Grant Koch tallied a pair of hits and drove in a run. Blaine Knight also earned the victory on the mound for Arkansas with six innings with six strikeouts and allowed just the one run. Starter Luke Heimlich pitched 4.1 innings for the Beavers with five strikeouts and all four runs were scored while he was on the mound. Tuesday night’s game, which was rescheduled due to weather problems on Monday, was the fourth all-time meeting between Oregon State and Arkansas, with the Razorbacks now leading the head-to-head series 3-1. Oregon State, which is playing in its third College World Series championship game in program history, following two previous appearances in 2006 and 2007, must win Game 2 to extend its run at this year’s NCAA tournament. The Beavers won the national title in its prior visits to the CWS championship game. Game 3, if necessary, will be on Thursday, starting at 6:30 p.m. ET.